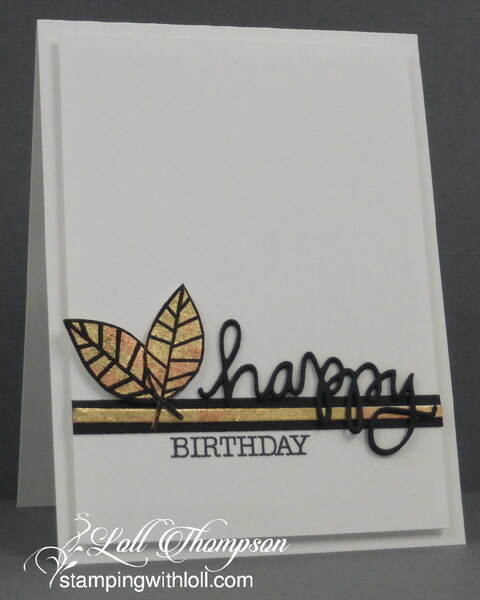 Stamping with Loll: Happy Birthday Gord! I find it's always good to have some pieces of burnished gilding flake card stock made up ahead ... makes for quick card making. I use a large piece of lightweight card stock* for the back, adding the double-sided sticky tape on top (Be Creative or Sookwang works really well), and then removing the top cover sheet and burnishing with gilding flakes. I use a small piece of Rubit-Scrubit (stamp cleaning pad) for burnishing. Now I have "gilding flake card stock" that's ready to go to create die-cut embellishments or fussy-cutting outline stamped and embossed images. * I recommend using lightweight card stock for the backing because once the tape and gilding flakes are added, it becomes fairly thick and will be harder to die-cut if you use thick card stock for the backing. I die-cut the happy three times and glued them together to add some thickness to the die-cut, and then glued it directly on to my card front. I stamped the birthday sentiment in black (a gift from the lovely Darnell --- thank you Dolly! ), and popped up my leaves for more dimension. Lovely card Bet hubby loved it. So interesting to know that you can make gilded cardstock! Love, love, love the effect! I'll bet Gord loves it too! Stunning card Loll, great idea stamping and embossing on top of the gilded card. Just want to thank you for lovely card that arrived today, much appreciated and I love that I have a Loll original watercolour! Please tell your hubby from me good luck and good health. It is certainly delighted with this wonderful card. She is odealna! Pure perfection and I really like the use of gold leaf. It gives an unusual effect. Beautiful masculine birthday card. Happy Birthday to your husband! You've just given me a wonderful idea to finally put the gilding flakes I bought....probably 15 years ago...to use! At the time I bought them I think I was just too intimidated to use them. I've since sold and given away plenty of used and unused crafting supplies, but I could never bring myself to part with that container of lusciousness. Thanks so much for the inspiration, and I'm sure the birthday card made the day extra special! Love the leaves! Love the card too! Another innovative idea! I never knew you could emboss on gilded flakes! Now I can't wait to try this, Loll! Thanks for the description. LOVE this card and how the outline stamps look with it. Thanks for all the inspiration! Love the way you used the outline stamp on top of the gilding flakes - I haven't tried that! The black is a striking contrast to the gold. Fabulous card for Gord. Beautiful, and I'm sure your hubby loved it! Hope his day was wonderful! Fabulous card Loll! And a clever idea to get some of the messy work out of the way in one go as well. I adore the tones of the flakes you used (am sure I have some exactly the same shades) - and such a great card as well. Perfect! Love what you did with the gilding flakes...such an amazing look, Loll! This is really stunning, Loll. That black really adds a classy look to the guilding flaked elements. Am sure Gord loved it! Loll this is so pretty, those burnished flakes look wonderful. Bet your husband loved the card. I have seen these burnished flakes before and love the fact there are so many different colours within the range. Very tempting. This is gorgeous! I also thought it was an inlaid diecut! Wouldn't have dared to emboss on it for fear that the powder would stick to everything! I still have some gilding flakes floating around from waaaay back - must look for it! Alles Gute for DH! I love how elegantly dramatic you've made this wonderful CAS card. Those touches of black are perfect. Oh, I love the effect of the gilding flakes on the leaves and your design is fabulous, Loll! I also love how you used black on this card...the quintessential perfect masculine card...I'll bet your hubby loved it, too! Beautiful use of the gilding flakes, a perfect masculine card. this is so stunning - I bet he loves it! A great masculine card and thanks so much for the helpful tips - those flakes certainly have wayward tendencies!! Another ab fab card! Thanks for the inspiration. I have just bought my first jar of gilded flakes and am looking for diffrerent ways to use them. This is the first time I've seen them being embossed on, so to speak. I didn't think that they could resist the heat without crumbling. Now I know. I will def try it out! Thanks again!